Three Seeded Sedge - Carex trisperma. The Three Seeded Sedge is a circumpolar species, found primarily in shady, mossy bogs and conifer swamps. The plant may have two to five perigynia in the terminal spike. The flowers are somewhat green in color and grow at the base of the spears around late spring to early summer. 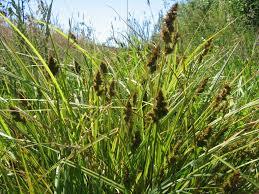 The stems of the Three Seeded Sedge have a thick, fibrous texture with three leaves tightly wrapped in a row. At full maturity, the stems have a spiky appearance and can vary in color. There are over 600 types of this plant in North America and they grow best in wet and moist, peaty soil. Three Seeded Sedge is a grass native mostly to the top Northeastern reaches of the United States extending from Maine, Connecticut, New Hampshire, Vermont, Rhode Island, Michigan, Wisconsin, Minnesota, and Parts of Canada. There are over 600 species of Carex in North America. Many times it is seen growing within a group of its species while next to other species of its genus close. Flowers appearing green in color, grow at the base of the spears around late spring to early summer, forming a batch of seeds within. Stems have a thick, fibrous texture with three leaves tightly wrapped in a row giving it a spiky appearance once fully mature and giving it a beautiful variation of leaf orientation and accenting among other plants growing on the river or pond side. The colors can vary from a creamy yellow-green to darker-green hues with some parts of the plant a shade of brown. Three Seeded Sedge will grow most naturally in wet to the moist peaty soil, sometimes even seen with water growing over the base of the plant's main stem. The building at the water's edge, Three Seeded Sedge will not only add an all-around natural look to your pond or natural landscape but also provide an excellent habitat for varying species of animals preferring moist conditions.